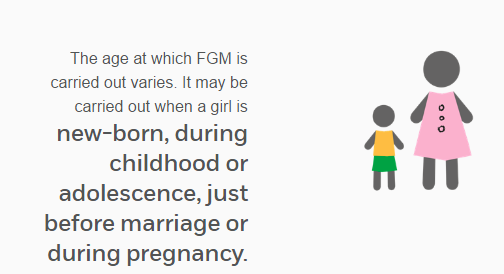 Female Genital Mutilation (FGM) is an illegal operation under the Female Mutilation Act 2003,it is a form of child abuse and as such, is dealt with under the school’s Child Protection & Safeguarding Policy. The school considers that FGM is a grave violation of the rights of girls and women. The school identifies that girls from African communities including Kenya, Somalia, Sudan, Sierra Leonea, Egypt, Nigeria, Eritea are at risk of FGM. It in addition recognizes that communities from Non-African communities including Yemeni, Afghani, Kurdish, Indonesian and Pakistani are also at risk. when leave of absence/holiday requests are being submitted by parents, the intention for going abroad or extended leave needs be written. Staff in school are trained. Whilst recognising that FGM is unlikey to be shared. Any actual reports or suspicion of FGM whilst overseas eg. Child talking about a celebration for them, lots of gifts, phrases such as cutting or a child is worried about going on holiday, will be reported immediately to the Senior Designated Person Mrs Stretton. If you as a prent have any suspicion in relation to another family it is your duty to inform the school. 21.3 From October 2015, it has been a mandatory responsibility of all staff members to report any suspicion of F of FGM to the police if the child is under 18 years of age. If st Staff will, in the first instance report their concerns to the Mrs Stretton, Mr Whheler or Mr Ranzetta.